“. . . and the sky blackened with dark, gray bodies. 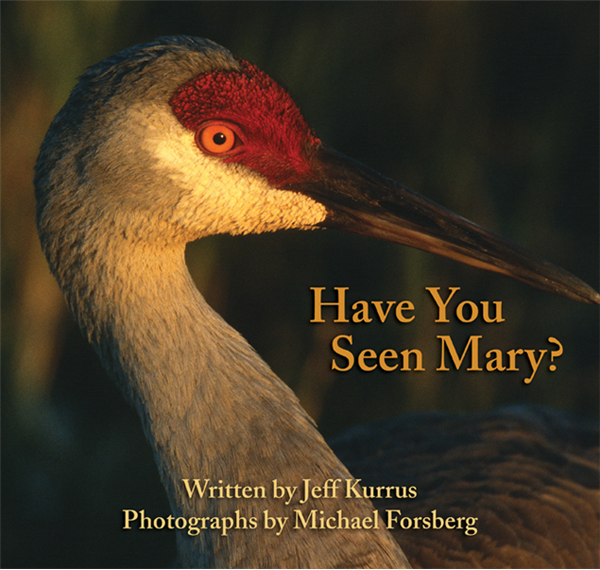 In the blurry confusion, John lost Mary.” So begins Have You Seen Mary?, Jeff Kurrus’s fictional account of one sandhill crane’s faithful search during spring migration for his lost mate. Set on Nebraska’s Platte River, this tenderly woven story of love is also a stirring introduction to these majestic birds, replete with Michael Forsberg’s radiant color photographs. This book will appeal to all ages, for it both entertains and educates readers about sandhill cranes. Jeff Kurrus is the editor of the award-winning wildlife publication NEBRASKAland magazine. He lives in Gretna, Nebraska, with his wife, Laura, and two-year-old daughter Madeline. Michael Forsberg is an internationally acclaimed wildlife photographer, the author of On Ancient Wings: The Sandhill Cranes of North America, and the coauthor of Great Plains: America’s Lingering Wild. He lives in Lincoln, Nebraska, with his wife, Patty, and their two daughters, Elsa and Emme. **Please note we have a limited quantity on-hand. Larger orders may need to be ordered in to fulfill.